AALS News is the official newsletter of the Association of American Law Schools. It is published four times a year, including a special issue in February that includes the AALS President’s Address at the Annual Meeting. 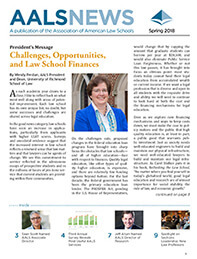 The publication keeps readers abreast of association activities, and provides information about awards programs and other opportunities of interest to law faculty. It is prepared and edited by the association staff and printed by West and Foundation Press as a service to the association and law faculty. A recent archive of past issues can be found below.